This coach was one of a batch of ten new to Central SMT in this case as their fleet number K43. Bob Alexander liked rugged reliability and from my conversations with the fitter at Greyhound, this vehicle fitted the bill being quoted as the most reliable vehicle in the fleet! It must have been a long drive between Sheffield and Arbroath in those mainly pre-motorway days. 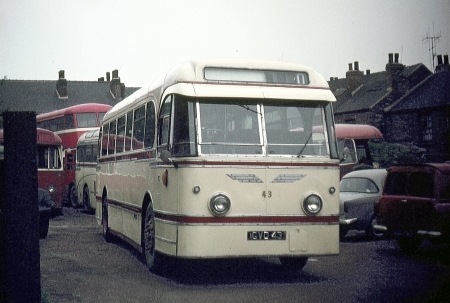 The coach is seen on 25 May 1968 amongst the typical junk in the depot yard at Surbiton Street in Sheffield. How I wish I had recorded (and kept) details of the wondrous collection of rolling stock to be seen there. Picking up a thread that has come and gone along the way. Alexander used to build a lot of vehicles either for, or to the designs of, other builders – particularly Leyland and Weymann. They had a coach which, fitted on the Royal Tiger, had a "a lot of" Leyland in it. Looking at this vehicle, it seems to have "a lot of" Weymann Fanfare in it – except that it pre-dates the Fanfare by some four years! Was Central SMT much of a coach operator? I’ve never tended to think of them as such. I believe these vehicles had bus type folding doors on the centre entrance. One of them found it’s way to Green Bus of Rugeley, Staffs and couldn’t have been any use at all for one man operation, the seating looks quite deep and comfortable though. Being a UF rather than an LUF, I imagine it would have been quite solid and rugged! Isn’t this the same body that "had a lot of" Leyland in it? It’s known as the Coronation style. That’s what I thought Peter, but the "Fanfare" characteristics had only just dawned on me. Because I’m not over familiar with the Coronation, I couldn’t remember whether it had the Dutch lantern type windscreen of the Leyland coach. Like many of its underfloor contemporaries, it was over-engineered for British use, with a weight approaching, if not exceeding, at times, that of a double-decker, hence the lightweight LUF later. I think that all manufacturers subsequently produced lightweight versions, apart from Daimler. BMMO were definitely the front-runners in this sphere after the war. I think this view http://www.flickr.com/ gives a more Leyland-like impression, but it is the same body. I was a big fan of the Fanfare, and coincidentally my favourites of all were Northern General’s on Guy Arab LUF chassis. Central SMT always had a few coaches, but mostly operated bus services in the Clyde Valley and along the north bank of the Clyde west of Glasgow. They were the main profit making branch of the Scottish Bus Group in the post-war period and subsidised most of the other branches. They left coach operating to Alexander Bluebird, Western SMT and Eastern Scottish. Yes, Peter, add Fanfares to my list of favourites. I didn’t have much to do with the many Reliances but knew the Sheffield JOC Leopards very well. Central S.M.T. also had a fleet of "bald headed" Y type Albion Vikings which were quickly sold on to Highland. The Vikings were then replaced by Bedfords. Later they bought deckers from Aberdeen Corporation, Regent III’s and Regent V’s. As Chris says, most of the major manufacturers over engineered their early underfloor-engined models and had to introduce lighter models two or three years later – in some cases overreacting and going too far the other way. However, it seems to me that good old Bristol/ECW seemed to get it right from the start with their LS (Light Saloon). Just as with the BMMO’s, both manufacturers built what the operator wanted because the manufacturer and operator were closely related, and there was much more feedback flowing between them. Like several of the other small fleets, Greyhound seems to have had a mixed fleet. It’s great for the observers, but I can imagine what it must have been like for the engineering stores people. It’s hardly surprising that so many fleets are standardised so heavily. There’s comment above about the Leyland and Weymann similarities. I must say it looks rather more Weymann Fanfare than Leyland to me. I’m sure (or am I ?) that this particular coach GVD 43 used to operate on a works contract in and out of Halifax sometime during the mid to late 1960’s, but painted in a black and cream livery. Did it ever belong to Pemberton’s of Upton ? They did a works service to the Meredith & Drew biscuit factory from its home territory, later taken over (on a larger scale) by Halifax J.O.C. 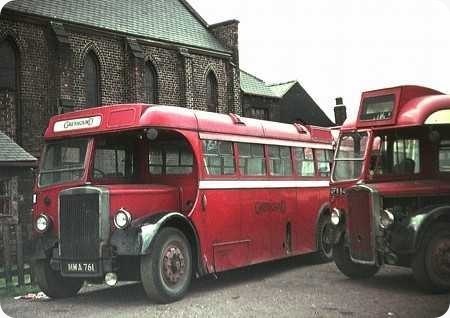 Green Bus of Rugeley (Staffs) had identical machines GVD 41 and 44. I was lucky enough to ride on GVD 41 on their stage service from Stafford to Uttoxeter on one occasion, so yes they were used on bus work. The view from the front seat made a pleasant change, and the vehicle was an interesting contrast to the North Western Leopard/Alexander Y type which had taken me from Manchester LMS to Stafford! So, were Pemberton’s the firm alluded to in Geoffrey Hilditch’s "biography" as having supplied a coach with " . . .a broken accelerator spring. A piece of string was secured to the pedal, and the free end given to the young lady sitting right behind the driver who was asked to provide the necessary tension . . ."? – which led, amongst other issues, to the contract being re-allocated to Calderdale JOC. I must admit that, given postings in another thread,and the timings, whether "GH’s" comments might have been aimed at Hebble – but seemingly not. Talking about Pembertons of Upton reminds me that when I drove for Stanley Gath at Dewsbury every year a large private hire job was for Thornhill Working Mens Club. This involved nearly all the fleet plus several other coaches hired in. On one occasion the destination was the inevitable Blackpool and one of the coaches was an elderly Bedford of Pembertons and as we loaded up at the club each coach took on pop and crisps for the children. When the driver of the Pemberton coach opened up his boot lid this fell off. Stanley himself was supervising loadings and he sent the driver and the coach back to his garage muttering that he would not use them again. My dad went to Sheffield in late 1947 to re-letter Greyhound buses before they could be nationalised – he had a painters/sign writing business in Monifieth near Dundee, would anyone know the story behind this? Answer for Jim Clarke. I am the daughter of Geoff Alexander, his father was Thomas Daly Alexander the owner of Greyhound Coaches of Sheffield and Arbroath…I asked mum but she doesn’t know anything about that time as it was before she was married. But she remembers a house in Broughty Ferry that Thomas had and behind it they did sign writing, was that your dad? Re Greyhound I distinctly remember it was winter 1947 he went to Sheffield as my mum was worried due to the bad winter of 47 – it was something to do with the nationalisation of coach services and to keep new coaches out of the hands of the government – I recall a holiday when we went all round England in the mid 50’s when we went down Snake Pass as Dad said this was the road he went to Sheffield in the snow of ’47 – my Grandad was also a signwriter and he probably stayed back in Monifieth to carry out more work to coaches there. This may be a mystery that will never be solved. 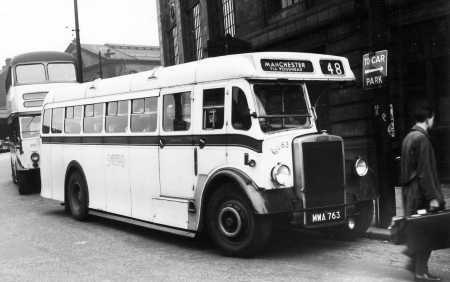 Sheffield bought eight of these buses in 1950 for the B fleet. Their O.600 engines gave them an enhanced performance compared with the earlier PS1s. These were the only Strachans bodies bought by Sheffield and were the last new half cab single deckers in the fleet. Five lasted until 1961 (including this one) and the other three until 1962. Seven were bought by Greyhound, the eighth vehicle becoming the first ever mobile library in the City. By the time this photo was taken in 1966 at Greyhound’s Surbiton Street depot deep in the east end of the City at Attercliffe, MWA 761 (ex Sheffield 61) had become a tow wagon with most of the seats removed. Why did Sheffield go to Strachans for this odd batch having previously bought Weymann and a few Cawood bodies for their post war single deck half cab purchases? Probably cost? At least some of the batch were used from Herries Road Garage on the Stocksbridge local services 257 and 357 where steep hills abounded. According to the PSV Circle, all were delivered with B34R seating but 62/3 later became C33R whilst 60/1 became C32R. Another oddity, why two different variants of ‘coach’ seating? It could have been cost or it could have been availability. If you wanted a few buses in a hurry in the late 1940s you didn’t go to a high-volume bodybuilder, as they were all snowed under with orders. Incidentally I’ve never heard of Cawood. Does anyone know anything about them? I’m pretty sure Cawood were based in the West Riding, somewhere in the Wakefield area. They built ten bodies for Sheffield A and B fleets on Leyland Tiger PS1 chassis in 1948/9. They were contemporaries of similar Weymann bodies supplied on Leyland PS1 and PS2 and AEC Regal. I had forgotten until I was looking up the above that Sheffield also had three PS1 chassis bodied by Wilkes and Meade in 1948 – were they a subsidiary of Wallace Arnold? From the deepest depths of memory… Cawoods were a transport firm, possibly in sand & gravel near Doncaster. Cawoods (same??) also had the Rootes dealership in the town in the 50’s. Any connection? "Greyhound" buses around Sheffield got the prize for the most ironic name. T W Cawoods & Sons were based at Bentley, near Doncaster. I don’t have exact dates when they were active but they did six rebuild jobs for J Bullock & Sons (1928) Ltd over the period 9/44 to 5/49. I commented on these rare beasts elsewhere on a Strachans conversation. Didn’t really know them (only knew Herries workings well when the 42/53 came to Low Edges) but wasn’t aware they’d ever been made into coaches. Do you KNOW Ian, or is it anecdotal? What is certainly true is what Peter said. Until 1950 Sheffield sourced bodies from Weymann, Cravens and Leyland and after that time from Weymann and Roe until about 1962. In the post war period 1945 – 1950, the preferred builders (of all operators) were unable to keep up with demand – they were often exporting to Government dictate – leading to operators going wherever they could to satisfy their requirements. Other than in this context, I’d never heard of Cawood but I believe they were a little like Wilkes and Meade who also built post war Tigers for Sheffield. Wilkes and Meade were a Leeds firm who were bought by Wallace Arnold and, after building and rebodying many vehicles for WA, eventually became their body shop – and sunk into oblivion. Roberts provided pre war bodies for Sheffield and then some post war AECs and the last trams, Crossley provided chassis and bodies for anyone in need (!) and NCBs last gasp included about 40 bodies for Sheffield. The quality of the latter was suspect but death duties killed the company who’s physical assets (raw material and machinery) were bought from the receiver by Charles H Roe – so a slight continuum from the 1950 AEC/NCB through the 1950s and 1960s Roe bodies for Sheffield. The reason for the conversion to coach seating, at least for some of them, was probably for their use on the Lakeland Tour, on which they performed before being ousted by the Leyland Leopards. I have a photograph of several of them lined up outside the Strines Inn, which was a refreshment stop on the tour. I went on it one summer Sunday with my grandmother, on a new Fanfare bodied Leopard coach, but this machine was likely already in Greyhound’s yard painted red by then. David, my information about reseating is taken from the PSV Circle Sheffield fleet lists dated May 1959 and October 1973 both of which refer to fleet numbers 60-63 as ‘later reseated to C33R /C32R’ (as appropriate). There you are. You can teach an old dog new tricks – I stand corrected. If they were coach seated, did they ever do Manchesters? 11 or 12 years was a very creditable first life after the introduction of under floors. Yes, David, they did do Manchester’s, and here’s a photo of 63 at Exchange Street about to undertake a trip on the 48; intriguingly, just across from Sheffield Victoria and the electric service through Woodhead tunnel to the same city. They were also active on the service 39 via The Snake as well. Thanks Dave – but look what’s behind, a 1952 Regent/Roe rebuild from the 1938 batch of Regent/Cravens! Regrettably the 48 went from Pond Street and was operated by North Western by the time I used it regularly. Thanks, Dave Carless, for the evocative photo of 63. I used to travel on the 48 with my parents to visit relatives ‘over there’. I can recall the Leyland Olympics on the service when they were new (despite being A fleet buses), a comment I still recall from my mother being that we would travel on a front engined bus ‘as the new ones smelled of diesel fuel’. That was in the days of duplicates, triplicates, quadrupilcates etc etc on the 48. The Strachans bodied PS2s always seemed to me to be superior vehicles and the photo of 63 confirms that view even after all these years. A very elegant looking bus. PS2’s were real flying machines. I don’t remember the Sheffield ones – it was a part of Yorkshire I rarely visited, but my local operator Hebble had six PS2/3’s with Willowbrook DP bodies (BCP 826-830) and boy, could they shift ! At the local Wakes holidays Hebble would employ all sorts of vehicles on the Halifax to Scarborough service, but a PS2 would leave everything else in a cloud of dust, and by the time the Royal Tigers, Regal IV’s and Reliances got there it would be parked up, emptied, cooled down its driver would have finished his dinner and be ready to set off back. Great buses. The Sheffield one shown looks really elegant to me. Strachans had a bad reputation though after the war – did these suffer the same reputation ? As I said, I had very little contact with these buses but as someone who drives both preserved buses and modern coaches big (engines) is best – so I would expect them to be superior beasts (especially when compared with PS1s). What really puzzles me is why Sheffield had so few PS2s when they waited for PD2s (and by-passed the PD1) for mountainous Sheffield. The Peak District is hardly LESS mountainous! One of the former Hebble PS2s, BCP 829 Willowbrook B33F, found its way to Great Yarmouth Corporation, and Geooffrey Hilditch recounts a splendid tale about this bus in his book "Steel Wheels and Rubber Tyres" Vol 2. On one summer Saturday, he received an urgent request from a Midlands operator for a duplicate coach from Great Yarmouth. PS2 No. 17 was the only vehicle available, and when it arrived on the pick up point, this "old fashioned" lady became the subject of much derisory comment from the Bedford driving fraternity, who decided to give No.17 a head start so as not to embarrass the Great Yarmouth driver too much by leaving him well behind. Off went the well loaded PS2, and the Bedford contingent finally caught up with it at the mid point refreshment stop, where they learned to their chagrin that the Great Yarmouth driver had completed his trip, and was now on his way back home. In halfcab times, there was usually a big difference in performance between single-deckers and double deckers with identical specifications. The PS1 was generally regarded as satisfactory for most purposes, which the PD1 never was (except by expert clutch-stoppers such as Chris Youhill!). Similarly I’ve even heard it said that Crossleys worked well as single deckers! The Sheffield Strachans PS2s Nos 56 to 63, MWA 756 to 763, were new in 1950 and I believe were the last half cab saloons supplied to Sheffield. They lasted until 1961/2 which was pretty average for the species. 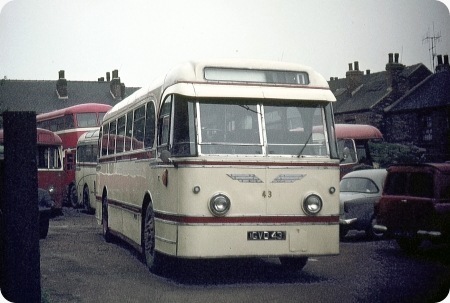 In fact, No.56 was converted into a mobile library for Sheffield City Libraries in 1962 and went on to serve in that capacity until January 1971 when it was sold for scrap. Sheffield’s six all-Crossley SD42 saloons lasted from 1947 to 1962 adding credence to Peter W’s comment above.